He also delivered some chicken noodle soup to the SCOTUS judge and streamed it live on Facebook, of course. Everyone needs to see what a caring person he is! This entry was posted in Culture War, Hollywood liberals, Idiots, Liberals/Democrats/Left, Media, social media, Supreme Court, United States and tagged #lookatme!, Christmas tree topper, Facebook, Michael Moore, Ruth Bader Ginsburg, Twitter. Bookmark the permalink. A Jew on top of a CHRISTmas tree. I was thinking ‘since when was it o.k. to impale a Jew with an evergreen’. Wonder if the tree has an obama head Christmas ornament. ‘A black man hanging from a tree’. But moore gets a pass? I’ve confirmed from friends I worked with conducting clinical drug trials in oncology, that Ruth’s tumors weren’t new, the are metastasis from her earlier cancers, Look for her to die soon, J.C.
Granny Moore (FTM) certainly has odd Christmas tree ornaments, she is obviously trying to out do the Obama’s Chairman Mao ornaments! ginsburg looks more like some one you might expect to find in a “ginger bread” house roasting little children. Moore seriously needs a hobby or a long vacation. Can you imagine what the space is filled with between his ears? him and not worth even looking at demonic anyway. Doc didn’t put her out, she was already (hic, hic) sleepy. Working from home with a bottle by her side. I doubt RBG can stand much these days, and neither can Moore without him stopping to catch his breath every 5 steps. You know damn well Moore didn’t put that up top of the tree. His big ol’ belly would knock the tree over before he could touch it with his hands. 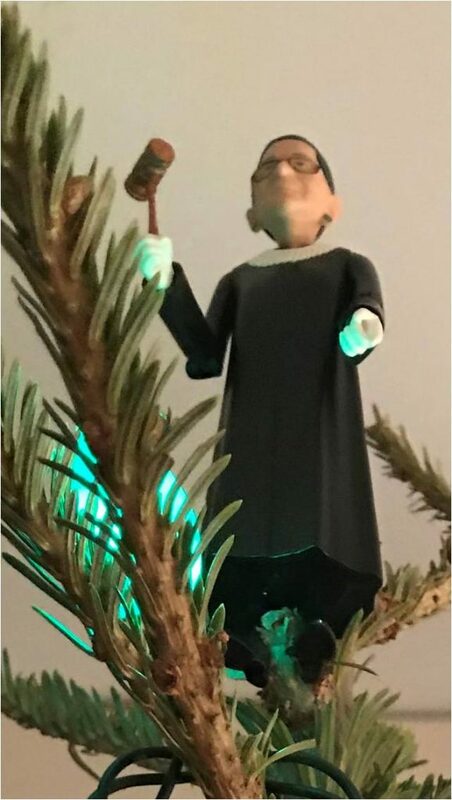 Where the hell do you get a ruth buzzy ginsberg tree topper. Or bobble head. This is all part of the demonic Left’s agenda against CHRISTmas. Last year, they promoted a Hillary Clinton Christmas-tree topper. I’m intending to reply to Lana @ December 24, 2018 at 9:01 am. Lana, we seem normally to be in agreement, but your statement is based on error which has been taught to too many of our White people. Jesus is not a jew as much as the jews and the Freemason “preachers” try to convince our people otherwise. Jesus Christ was AGAINST the anti-Christ jews, which is why they arranged for his murder.